The continents merge, due to plate tectonics, to form the Rodinia supercontinent. Oxygen-producing photosynthesis binds carbon dioxide. Volcanic activity is low. There is only a small amount of greenhouse gases in the atmosphere. The Earth starts to cool into a Snowball Earth. A relatively short-lived supercontinent, Rodinia, forms, as the fragments of the Columbia supercontinent reorganize. 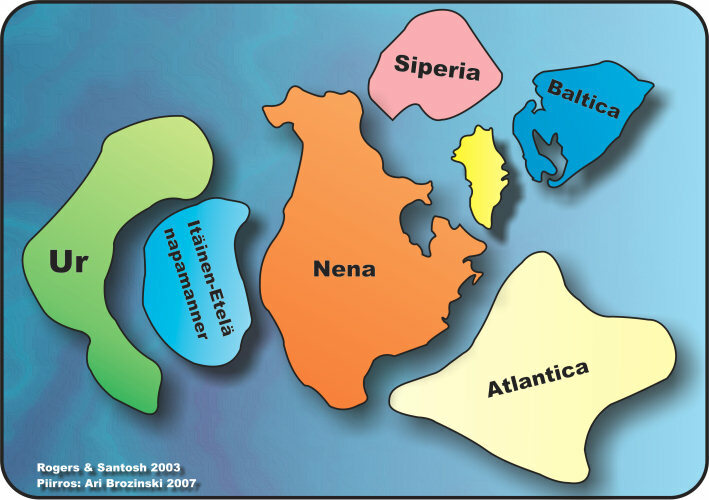 A large part of Rodinia was formed in the so-called Grenville collisions, where Atlantica and Ur combined with Nena. In addition to Rodinia, other names have been suggested for the supercontinent, such as Ur-Gondwana and Paleopangaea. Rodinia is a derivitive from the word ’to grow’ in Russian. Rodinia was at its most expanded state 1000 million years ago. There are multiple opinions of how Rodinia was configured, but the arrangement of this continent is still uncertain. This is mostly due to the lack of paleo-magnetic data. It seems that the craton Laurentia (Northern America) was in a central position and other groups of continents and cratons were more-or-less attached to it. Rodinia was surrounded by an ocean, Mirovoi. The breaking up of Rodinia, about 800 – 700 million years ago started a period of the cold ages.